New renovated, modern but with the certain something of the monastery atmosphere. Tradition and modernity are carefully put together and so the bright bathrooms shine under the old beams. The rooms are made of local wood with warm colours. Our offer includes single rooms, two bed rooms, double rooms and a little suite, bookable with breakfast or half board. Contact us for a personal offer. We are looking forward to make you a personal arrangement. 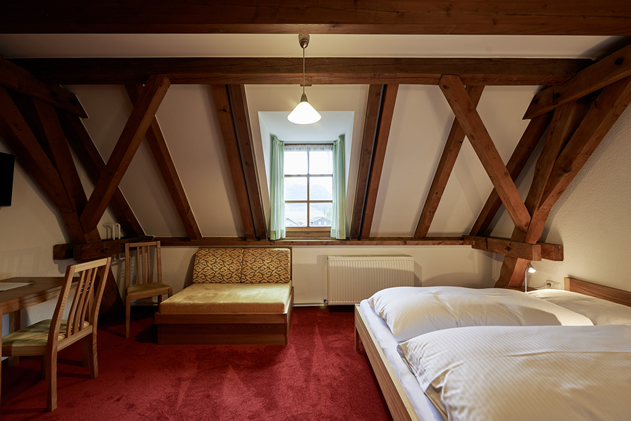 Roomprices 2018 "Im Kloster Bezau"
You can use your rooms from 3 pm from arrival until 10 am on departure. The prices are per person and day including all dues from two overnight stays. When you stay just one night, you have to pay an extra charge of €2,00 per person and day. If you use a double room as a single room the extra charge costs €12,00 per day. Reduction in the shared rooms. Pets are not allowed at our house. Cash payment, VISA, Mastercard/Eurocard and EC. We recommend you a travel insurance. 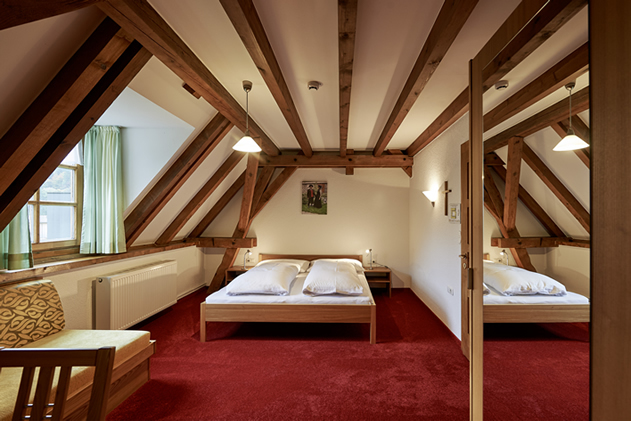 You can still feel the flair of the monastery in the 12 to 14 m² big, homey and comfortable rooms, even when the “cells” are more comfortable now. The orientation of the rooms are on the east- and south-side of the house and they feature a wonderful view on the impressive mountains of the Bregenzerwald. In the 24 m² big two bed room „Comfort“ it is possible to separate the beds. 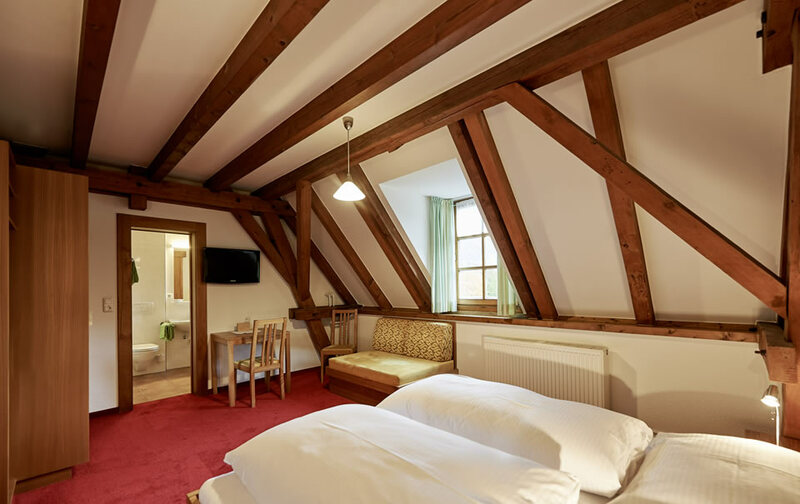 The rooms are equipped with a lot of wood and combined with the old beams. They offer a comfortable and homey atmosphere. The orientation of the rooms are on the east- and south-side of the house and they feature a wonderful view on the impressive mountains of the Bregenzerwald. The double room “Elegance” is 28 m² big, comfortable and cosy. The couch can be used as an extra bed. The rooms are on the east-, south- and west-side of the house and are bright and broad equipped. 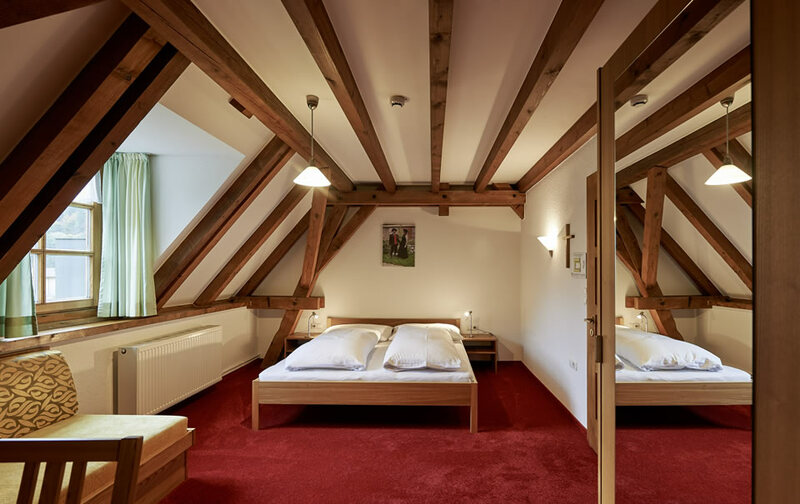 The Junior-Suite “Im Kloster Bezau” is 34 m² big. It is bright and comfortable arranged. Here are four beds and a couch, which is also usable as an extra bed. 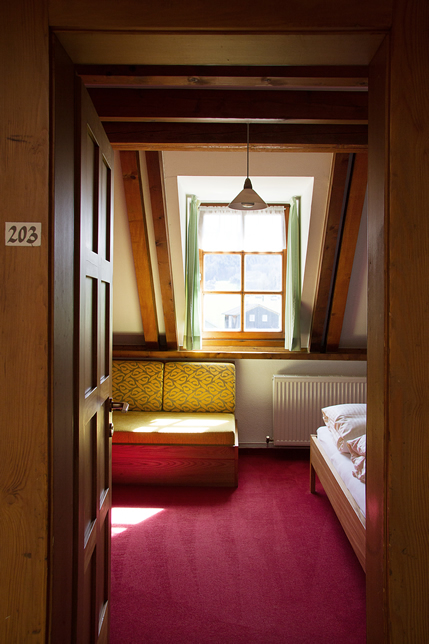 The Junior-Suite is on the southside and very peaceful with its view to the mountains of the Bregenzerwald. For sporty enthusiasts the Bregenzerwald offers almost unlimited possibilities. It is also very nice to calm down, find time and let your mind wander. Ride your bike on the trails of „Bergkäse"
Be active, have fun biking, enjoy the nature and the mountains. That is the pure bike-pleasure! The wide range of bike-tours from easy to highly ambitious is extraordinary. A lot of the paths lead you on the trails of the life culture in Bregenzerwald: to hamlets, villages, pastures and alpine mountains, where the delicious Bregenzerwald cheese is made. Norbert Schneider, our senior boss, is an enthusiastic bike-fan himself and certificated mountain bike-guide. He knows exactly what you need and what is important on a bike-holiday. There is lots to discover in the Bregenzerwald mountains. Rambling and hiking paths take you to the loveliest spots, and tell stories. Events are held. 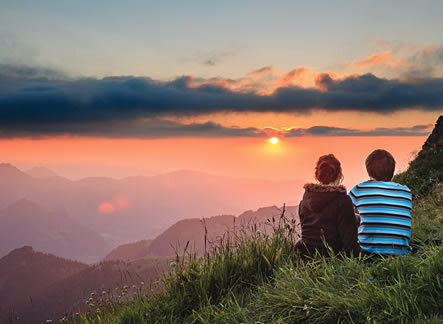 The Bregenzerwald Guest Card is your “ticket” to these mountain experiences. 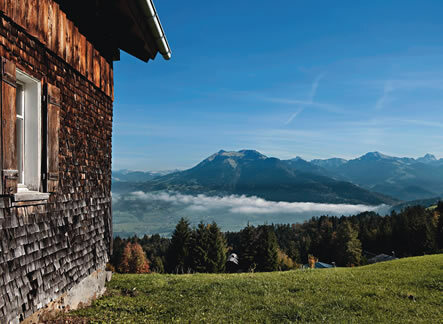 The Bregenzerwald Guest Card is available to all visitors who spend at least three nights in the Bregenzerwald, and is included in the accommodation price. You get to know the hospitality in the Bregenzerwäld. We want to spoil you “Im Kloster Bezau” with regional delicacies and make your holidays to a real pleasure.